Most of the summer music festivals I’ve attended have existed for decades and are well established in their traditions and routines. This month, however, I had the chance to participate in a brand new festival: the Sejong International Music Festival, held at the Curtis Institute of Music, in my hometown, Philadelphia. Under the artistic direction of Hsin-Yun Huang, SJIMF, or Sejong, offers young musicians a chance to learn from world-renown artists, and to work with them in private lessons, as well as chamber music coachings and masterclasses. The star-studded violin faculty includes Ani Kavafian, Carmit Zori, Kyung Sun Lee and Ju Young Baek. During my two weeks at Sejong, I was able to work privately with each of these violinists. I learned so much in this compressed period of time, benefiting from the variety in their style and approach. 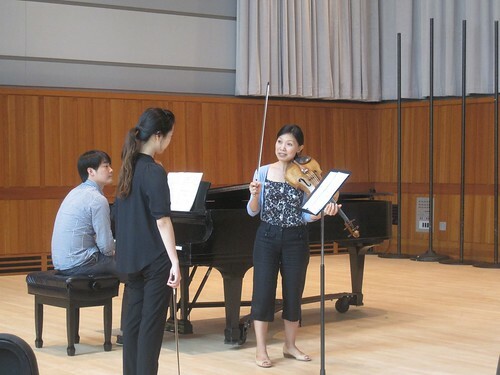 Artistic Director Hsin-Yun Huang teaching a viola masterclass. But unlike other festivals, Sejong presents an unusual opportunity to learn about the teachers’ personal philosophies, on a musical, intellectual, and even spiritual level. Usually, my interactions with teachers are confined to working with them on how better to play the violin, and how better to make music. While, to me, these kinds of lessons are genuinely enthralling, I’ve often wished for a chance to pick my teachers’ brains further, to hear them talk about their lives with the hope of absorbing some of their wisdom. At Sejong, every morning from 9 – 9:30, the students, staff, and faculty gather in the same room for the “Morning Meeting”, or “Inspiration”. During each meeting, a different faculty member gives an informal presentation. The topics, chosen at the discretion of each teacher, are as varied as the members of the faculty themselves. Some speak about their time as students, and share charming anecdotes from their own musical journeys-- mistakes they made along the way, or experiences that changed them. Most play recordings (ranging from a performance by the baritone Dietrich Fischer-Dieskau, to a movement from Messiaen’s Quartet for the End of Time) or read excerpts from books that are precious to them. Ignat Solzhenitsyn read to us from “Beethoven: His Spiritual Development” by J.W.N. Sullivan. Kang Ho Lee quoted Milan Kundera, and encouraged us to see our lives and music-making not as a highway or a means of getting from one place to a next, but as a road to be walked along, reflected upon, and enjoyed. For me, it is invaluable to hear these artists perform and watch them teach. And this rare opportunity to hear them share their thoughts about their art brought me to a new level of understanding about music. These teachers have so much knowledge that we, as music students, are hungry for. But, in our quest for improvement, sometimes we forget the bigger picture. I only wish there were more opportunities to hear the teachers and performers that we admire speak about their lives as musicians, and what inspires them. I left each meeting feeling invigorated, and as we students headed to our lessons or practice rooms with new ideas to ponder, I felt a collective sense of newfound purpose and dedication to our art. 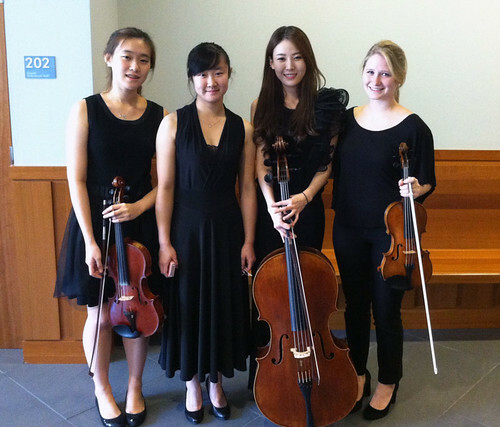 My piano quartet after our performance.